Hi there, Type A readers! My name is Meagan and I'm guest posting from Fairly Fabulous. My First Chalk Paint Piece!!! I feel like the last person to us Annie Sloan Chalk Paint. Finally, I've used it, and like everyone else I LOVE it! It was a little touch and go at first, and the wax is gaining my admiration, but in the end, I'm beyond pleased with the products. I really like the hand painted look of the piece, which says a lot, I usually go for a flawless finish. This is the first piece in my house that I have actually hand painted with a brush. The rest have been sprayed. Well, I'm gonna stop singing the praises of ASCP, and show you my finished piece. I hope you love it as much as I do! Check out the cute model! Isn't she adorable? I just wanted to thank Adithis Amma Sews for giving me such a wonderful award! Thank you so much for thinking of me! Now that I have your attention, Confessions of a Craigslist Junkie is having a Give Away!!! $50 gift card to Home Goods, how fun! Good Luck!!! Sorry to get this too you so late, been one of those weeks. Not having my Guest Post this week kind of derailed me, but I hope to be back on track next week! I do want to share with you some great links from last week, the party was AMAZING!!! 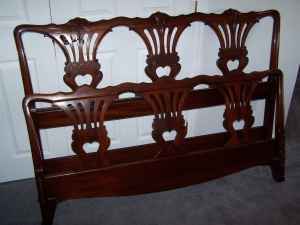 Lilyfield Life scored this gorgeous buffet off Ebay! If only I could be that lucky! Annie Sloan Chalk Paint GIVE AWAY!!!! Check out this WONDERFUL Give Away over at My Wonderfully Made, Lauren is GIVING Away Chalk Paint!!!! LOVE!!! Baby Pickel, My New Affliate!!!! It's true, I have a new Affiliate!!! They sell a mason jar packed with little baby items. The jars ingredients (how cute is that, ingredients!) are a bib, hat, onesie and booties. A little bit of everything an expectant mother might need. The best part, for every jar sold a jar is DONATED! 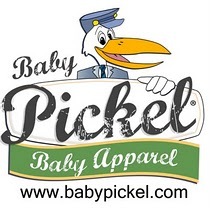 Yep, they are some pretty caring folks over at Baby Pickel. Their stuff is even made in America! There is more info on their website, plus you can check out my Affiliates page too. Okay, so of course there is a GIVE AWAY to go along with the introduction. 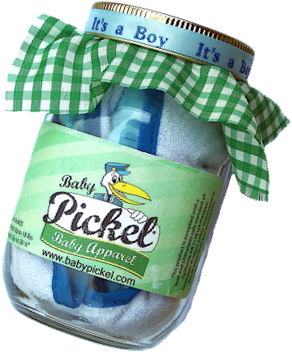 One lucky Friend will win a Baby Pickel jar! You get to pick if you want one for a Boy or Girl. I will announce the winner on Sept. 2nd 2011, two weeks from today! ﻿The GIVE AWAY is open to all US Residents 18 years or older. Friends, can you believe it's a year today that I wrote my first post!? Crazy? It's been amazing getting to know all of you, I can't wait to see what the next year brings. Thanks for all the wonderful comments and support! Check back tomorrow, I have a new Affiliate to tell you about and a GIVE AWAY that goes with it! Here are few pics from my first trip to Ikea with Sommer and our girls. Okay, so my little ham was really excited about the camera. I had to practice taking a few shots on the trip over. Betsy at My Salvaged Treasures!!! Congrats Betsy and thanks everyone that entered! Check back tomorrow for another GIVE AWAY!!! Highlights from #29, and Sneak Peek at the Garage Sale! Sommer from Designer Garden, you know my Bestie, and I had a garage sale. Not your average garage sale, but an "Upcycled Sale". We did a pretty good job too, here are some pics. You can check out her blog for some befores on things too. I’m Kristy from Hyphen Interiors. I’m excited to be guest posting on Type A Decorating. I met Tammy through one of her link parties a few months back. She has always been super nice and open. We even did a series on blogging tips together, at the same time on each of our blogs. It was called “Before the Paparazzi” if you want to check it out! Tammy said to tell you guys a little about myself and my blog! 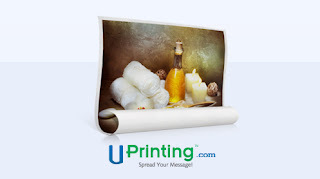 The WONDERFUL folks over at UPrinting.com are offering one of my Friends a FREE 16x20 Rolled Canvas. How Amazing! I can't wait to place an order with them, they really have unbelievable prices on rolled and stretched canvas. I almost didn't get this post done. I've been crazy busy with school starting for both kids. Remember, with the girl in school, now I get two whole days to myself! Sneak Peak of some of the things Sommer and I are preparing for the sale! G'day to all my fellow Type A followers! My name is Megan from over at Meg and Mum's and I hail from Adelaide, South Australia. I was so chuffed when Tammy asked me to do a guest post for her blog. It's my first ever guest post and I'm a little nervous. I love Craigslist, but I hate the waiting! I want you to get back to me immediately and accept my offer! Am I asking too much? It just bothers me, that it will take some folks days to respond. Another pet peeve of mine, if the item is sold, take it off Craigslist! Just wanted to share some pieces I'm waiting, not so patiently to hear back on. This first bed would be great for the next house for my daughter. They are asking $135, but it's been on the market a while so I offered $90. I just bought my daughter an entire bedroom set, but the bed is a little boyish, and I thought I would use in in my sons room. The Pre K Happy Dance! It's more like a jig really. I wish I could video myself doing it. My youngest started school this week. I can't believe she is in Pre K, where does the time go? I'm really excited, insert jig here, I hope to get some projects done and relax. Another great thing will be being able to get my errands ran without children! No more screaming fits and begging for stuff, and stopping to pee in every public bathroom. Okay that last one may still happen. 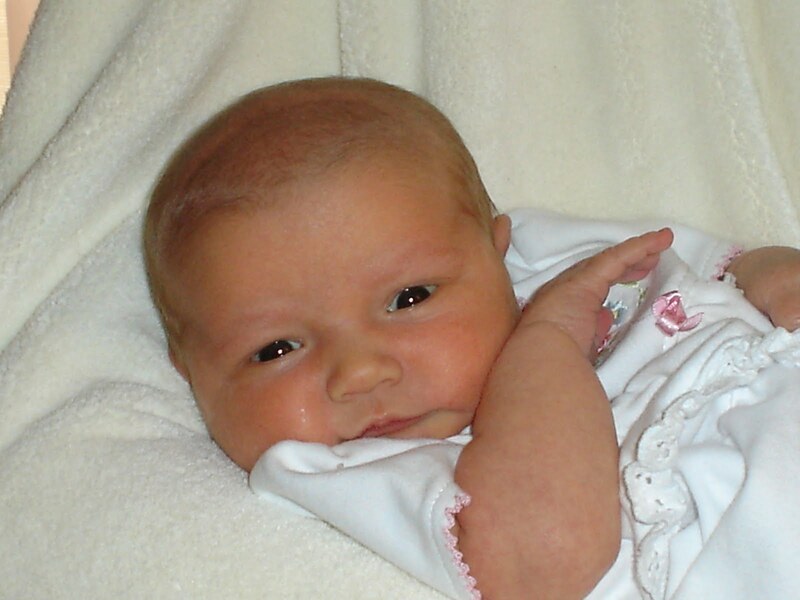 Here's Lauren Avery about a week after she was born. Wow, you guys blew me away this week. Another fabulous party!!! Primitive and Proper shared this adorable minty piece, Cassie made it by creating her own Chalk Paint color! I'm so excited to be here. This is my first guest blog and I'm so excited (and a little nervous). First, I'll introduce myself. I work full time as a health educator and spend lots of time crafting. I graduated from Baylor University - Sic 'em Bears! I have a handsome husband of 2 years and two crazy dogs.